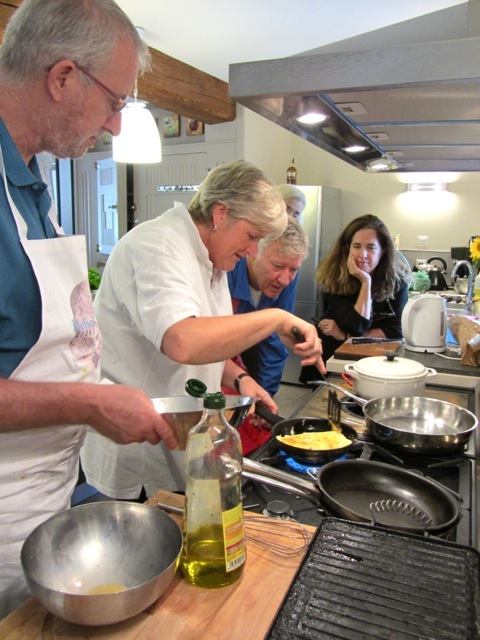 We just got news of cancellations for the October 2013 workshop–freeing up several places. Below are some impressions from Bravehearts (my name for those intrepid souls who’ve been brave enough–crossing continents in some cases–to take a risk and sign up!) who came to the previous workshops (October 2012 and May this year). I liked the small, hands-on nature of it. Robin made the whole thing feel very informal and yet everything was very well organized. I also like that there were breaks. I never felt overwhelmed. 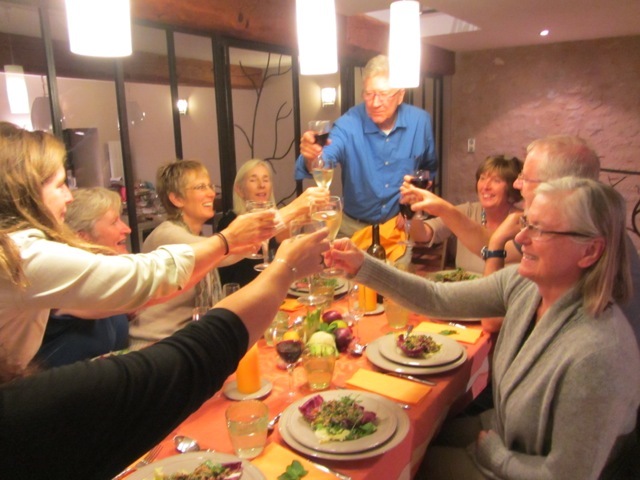 Indeed, the whole thing felt like the most amazing multi-day dinner party at which no one ever was tired or bored! 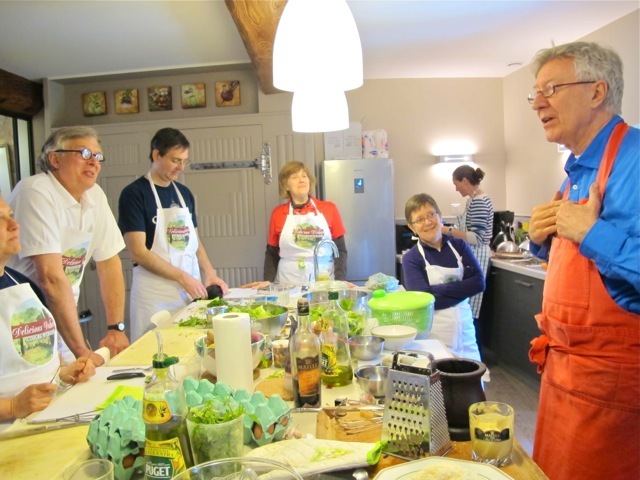 Robin’s teaching method: his ability to present his recipes and ingredients to a group of total strangers in a way that put everyone at ease. That naturalness of manner helped everyone work very well together. It was fun! Excellent kitchen workspace worked very well for this size group. Well-lit, squeaky clean, not too industrial, new appliances…Much like a well-appointed home kitchen which enhanced the feeling of camaraderie among the participants. 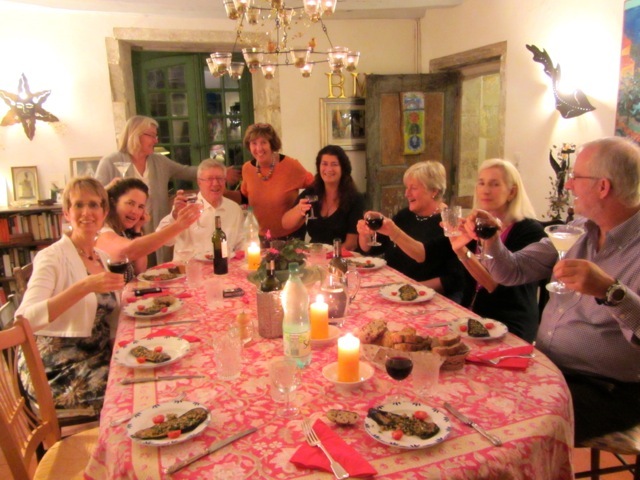 I enjoyed cooking and dining with the group–Robin’s happy approach to cooking – not fussy or dogmatic – and his relaxed approach to the class. 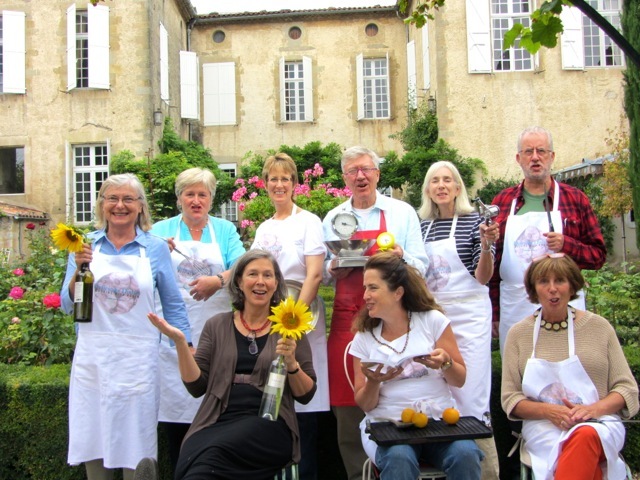 This workshop succeeded because of Robin and Meredith (and Daisy and Valerie and Dominique and Philippe)! 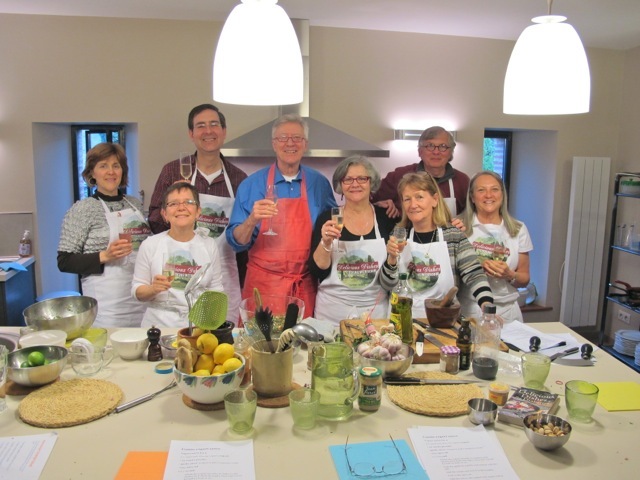 Their charm, encouragement and enthusiasm for cooking and living well was contagious! The wine cellar was amazing! Our final lunch on the terrace was memorable. Wine at Robin and Meredith’s house at the end of the class was the icing on the cake. I have always loved olive oil but we are constantly being bombarded that we should cook and eat as fat free. 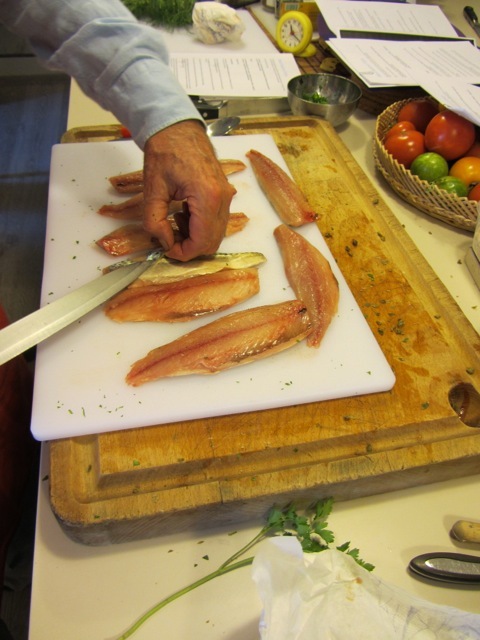 After attending your workshop I started cooking with olive oil on a regular basis. I eat it almost every day now. I had my annual physical last week and I was very curious to hear my cholesterol levels as I was so afraid ingesting the olive oil would drive up my numbers. This was going to be the moment of truth…… My cholesterol was 166 down three points from last year’s 169! Not bad at all. I have even dropped a few pounds. So what is with this fat free hype? Come be a Braveheart this October–3rd-6th! So here’s my question: Have you ever thought about signing on as a guest speaker on the Queen Mary 2, dear Captain Poldark? Perhaps you already have done so. But if you haven’t, I’ll bet Cunard would love to have you as a speaker. It’s a lovely thought, Pamela and lucky you too. Did you come into NYC passing the Statue of Liberty? I always dreamt of crossing in one of the “Queens” as a child in the fifties. There are so many people in the world who love “Poldark” . . . and with your cooking blogs and cookbooks, I think you’d be one of the most popular speakers that the QM2 has ever had. Would so LOVE to participate in one of your sessions Robin. Will be travelling to France for the first time ever in December and spending a week in Paris and Nice, but not in your neck of the woods, and wrong timing for the October workshop. Being my trip of a lifetime I might not make it back again, but I’ll let my vivid imagination take me there whenever I want, by following your blog.